This men's kimono robe is distinctive and regal, with a 6" square, satin gold embroidered "Samurai" calligraphy symbol on the back and a red Sakura crest on each front panel. 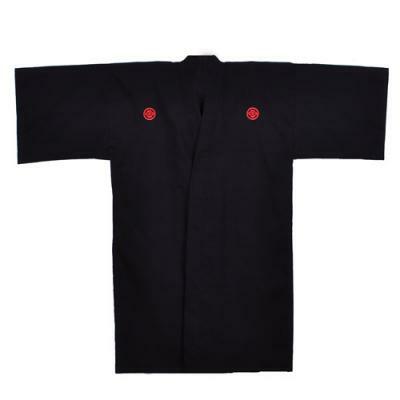 This traditional samurai robe is made in Japan of 100% shantung cotton. Shantung is made from cotton spun fibers providing a weave design and a ribbed effect. Slubbed yarns are woven into the material. This produces a durable, nubby fabric which contains an airy feel with a textured and visual attraction. This Japanese embroidered kimono robe comes with a matching belt. Available in size: Medium/Large, Large/Wide and XL. Medium/Large, measures 58" in length and is designed to fit a man 5' 7" to 5'10" in height . The shoulder width is 25", sleeve length is 15" and the girth is 46". Large/Wide, measures 58" in length with a wider and roomier fit. This traditional samurai robe is designed to fit a man 5' 7" to 5'11" in height. The sleeve length is 15", the shoulder width is 31" and the girth is 57".